There is a lot to find interesting at Duddells. The exquisite food from Hakkasan's former Executive Sous Chef Daren Liew, the interesting church conversion and for me, a fresh new option for business events. Duddells of London has a Mezzanine level that is available for exclusive use. The L shape lends itself well to a drinks reception and one long table seating Forty guests (in the longer part of the L) You can seat more guests if you are happy to split them across two tables. The mezzanine is open and this would create sound challenges for some events. It would not be suitable for an event where a formal presentation is being delivered. While the noise from downstairs is not invasive for something like a quick welcome address, a presentation would not work at all. If you had a group who have spent a long day in presentations and are looking for somewhere to really relax and share some really conversation worthy food, it would be perfect. It would be a good party venue too. I visited on a Saturday evening and it was vibey! In London, it can be difficult to get completely private venues for larger groups outside of the traditional hotel scene. While Duddell's is not completely private, it is an interesting new option for business events to consider when a relaxed atmosphere is required. The service was charming and sincere. The crispy duck lived up to all the promises. I will probably add Duddells to my list of venues for a business lunch with clients who like new experiences, good food or who are travelling into London through London Bridge Station. I will write again if JD does an event there this year to let you know how it goes! A firm favourite among Hong Kong’s art world elite, Duddell’s has finally landed in London. And when it comes to location, could not have picked a more dramatic spot for their first international outpost. 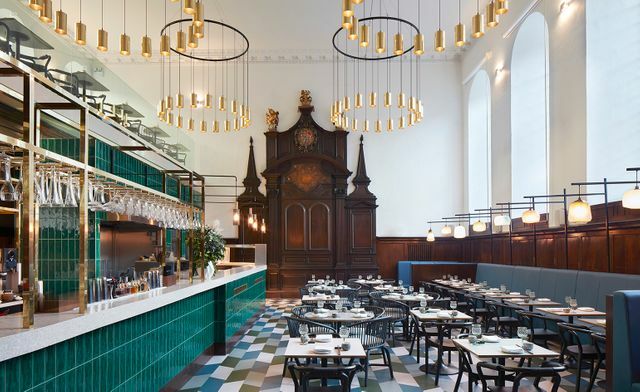 In the Grade II-listed St Thomas Church, a few steps from the Shard, high stained-glass windows, original dark timber wall panelling and ecclesiastical altar sets the tone for a modern aesthetic inspired by traditional 1960s Hong Kong tea houses; set over two levels, bold green and blue-grey hues are revealed. Here, chef Daren Liew churns out the same elevated Cantonese fare that won the restaurant its legion of Hong Kong fans and its two Michelin stars. Expect exquisite handcrafted dim sum, crisp roasted duck and an array of perfectly executed small bites from wagyu beef baskets to spicy soft shell crab.